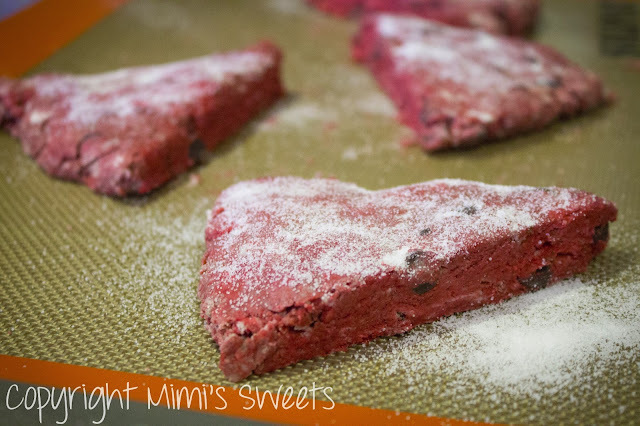 These mouth watering red velvet scones are filling and satisfy your sweet tooth! Besides my creative whims and customer orders, my husband's cravings for different foods inspire some of my new baking adventures. One evening, my husband told me that he really wanted some scones. It seemed a bit random since I had only seen him eat a scone once in all the eight years that we've been together (until I made them). I had never made them, and I had only eaten one myself in all my almost thirty years of existence (tree nut allergies and dairy sensitivity can really be a bummer). I've served too many to count when I was a supervisor at a very popular coffee chain (they will remain nameless), so thankfully I knew what they were supposed to look like and what their texture should be. So, I figured I'd give it a shot... which put me on the hunt for a recipe that was basic enough for me to look at it and be able to add, subtract, change amounts, or replace the ingredients as I saw fit, to make the best scone recipe possible. After much searching, I finally found my starting point here. 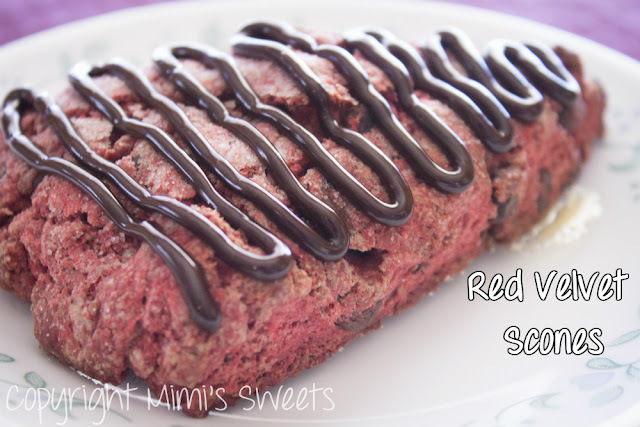 I actually made a batch of chocolate chip scones with a buttercream drizzle before making these red velvet ones. However, my husband ate them all before I could get any pictures! Please accept my apology for that one. Haha! Clearly, he more than enjoyed them since each recipe makes eight and they all disappeared before I could get pictures! They turned out so well that I decided to make more, but did red velvet with dark chocolate chips the second time around. I made sure to take pictures during the making process and when they were done before my husband got his hands on them. Pictured at the top of the post is the red velvet scone with dark chocolate ganache drizzle. However, if you don't like them as sweet (like my husband), I also put a cream cheese drizzle on some of them. Again, there's no picture of any with the cream cheese drizzle because they were eaten too quickly. Come to think of it, he has been asking for more scones... So, you may be seeing another scone post in the near future. For your enjoyment (below), I included a picture of the red velvet scones right before I put them in the oven. These scones were crumbly on the outside, soft on the inside, filling, satisfying, and a good bit healthier than store bought and even the ones from the link I shared (did you see the nutritional values from the linked website?!?). Can't go wrong with these! Perfect for a gathering, party, tea, or just because you want breakfast to be a little more special! Order today. You will not be sorry! If you are a fan of red velvet, check out my Red Velvet Cheesecake Brownies, Red Velvet Cheesecake, Red Velvet Cookies, and check back next week for my post on Red Velvet Cupcakes! Thanks for stopping by!